I hope many of you had the chance to check out my review of UNBELIEVABLY GLUTEN-FREE! by Anne Byrn. I made the Gluten-Free Mac & Cheese, and I was pleasantly surprised by the simplicity and taste of the dish. There is a Unbelievably Gluten-Free Holiday Sampler now available with plenty of great recipes that are perfect for Thanksgiving including Pumpkin Pie, Pumpkin Spice Bread, and Corn Bread Dressing. 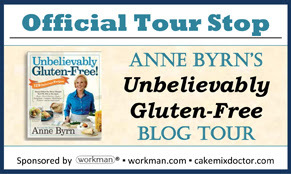 Ms. Byrn is having a Facebook chat on Wednesday November 14th at 6pm ET / 4pm MT to talk about all things Gluten-free! Whether or not you’ve seen her new cookbook, UNBELIEVABLY GLUTEN-FREE!, she wants to hear from you about your experiences, and answer any questions you might have about baking and cooking food so delicious you would never know it’s Gluten-free! I hope you are able to check out at least one of these fantastic opportunities. Be sure to let me know if you try any of the Holiday Sampler recipes over the next few weeks! I'll try to remember to check out the links over my lunch break.